Last year, a lady at a craft fair showed me how to use a cute little die to make a cute little hummingbird out of an old beer can which, in theory, was going to be hung on my screen door for decoration (the hummingbird, not the beer can). I thought this was such a great idea that I immediately bought myself a die cutting machine and a couple of bird dies, in spite of the fact that a) I detest decorations on my doors or walls, b) I don't know anyone who would want to hang anything from their screens either, c) I had to drink dozens of cans of assorted beverages in various colours in order to provide the bases for the diecuts d) I have never successfully completed a craft project in my entire life and e) I don't like birds. So it was that, by December, I had exactly 4 hummingbirds in stock. Then the activities director suggested I should take my wares to the park craft show. Since it was a slow time in January and (as previously noted) nature abhors a vacuum, I decided to start a) drinking pop like there's no tomorrow and b) cutting dies. With the help of my sisters, we bashed out about 100 of them in a variety of colours and dang..... they just about sold out! So I drank more pop, cut more dies and went to another craft show in February.... and darned if they didn't sell even better. I also got addicted to Fanta Grapefruit Soda....which is a whole other story. So naturally, I bought a whole bunch more dies and drank a lot more pop and produced dozens and dozens of birds, butterflies, dragonflies, cats, dogs and bunnies for the March craft show.... in spite of the fact that many people had left the park already. And wow... that one was the best of all! Just to show you how unhinged I've become, I even hung some of them on my own screens. I didn't want to be the only person in the park who didn't have any. Guess I'll be doing craft shows from now on. No rest for the retireds, I guess. In order to satisfy their own crafting urges, my 2 sisters volunteered to produce flowers for a 90-year old woman's birthday cake. 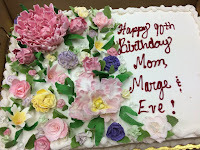 This lady loves peonies and her daughter thought it would be nice to have a specially made cake to mark the occasion. 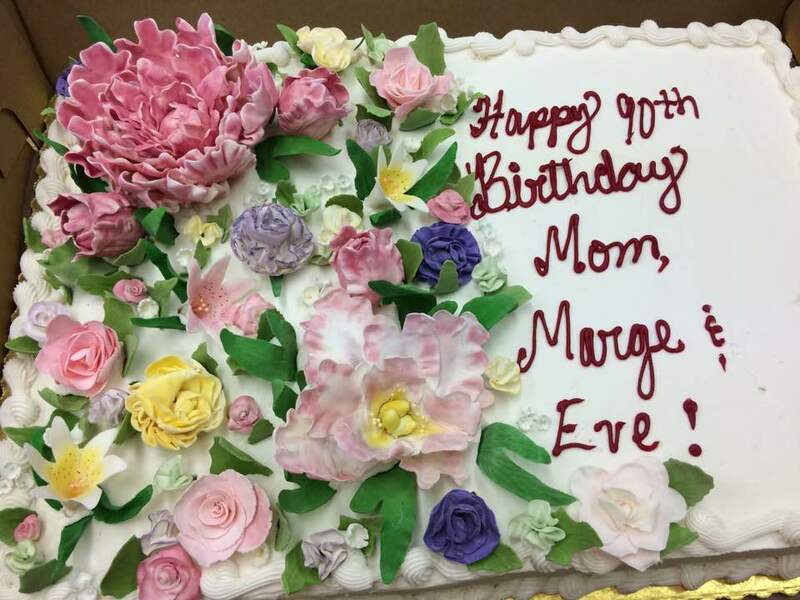 Then the lady's friends also said they'd be coming and they were also celebrating 90th birthdays. So the girls made flowers for over 5 weeks to cover 2 huge cakes. The flowers were made out of sugar and were absolutely beautiful! 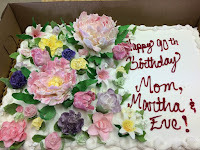 Peonies, carnations, lilies, roses and baby's breath were heaped on the cakes. At the end of it all, we all felt that we were "crafted-out" and we plan to lay low for awhile. Or at least until the next craft fair.